Using radio-frequency, therapeutic laser and vacuum suction. Collagen and elastin is stimulated to reduce the signs of aging and vacuum suction drains away puffiness and contours the area. 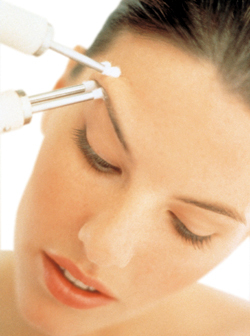 Using micro current to tighten and firm the delicate eye area. *Please remove your eye makeup before your visit.